One of the four known forces of nature, which operates only between certain sub-atomic particles, and which is responsible for most forms of radioactivity. The point in a chain at which it is most vulnerable to breaking. For those seeking to break the chain, this is a point to be concentrated on. For those seeking to keep the whole chain together, this is also a point to be concentrated on! “In science, our knowledge is only as strong as the weakest link in the chain of understanding.” —Stephen Rothman, a prominent (non-Marxist) American biologist, Lessons From the Living Cell (2002), p. 17. 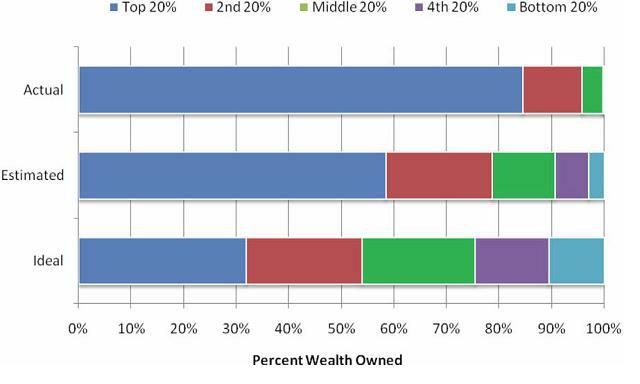 WEALTH DISTRIBUTION — In the U.S. Moreover, even within the top 20% of the population the wealth is very concentrated in the top few percent. Some estimates indicate that the top 1% of the U.S. population, the biggest bourgeoisie, owns nearly 50% of all the wealth. [J. B. Davies, et al., “The global pattern of household wealth”, Journal of International Development, vol. 117 (2009).] The concentration of wealth in the U.S. today tops even that of 1929, just before the Great Depression of the 1930s! “The top hundredth of 1 percent of U.S. taxpayers—that’s 16,000 people—have a combined net worth of $6 trillion. That’s as much as the bottom two-thirds of the population. Meanwhile, a quarter of American families say they have no money in a checking or savings account to cover an emergency, according to Bankrate.com.” —Peter Coy, “An Immodest Proposal”, Bloomberg BusinessWeek, April 4-14, 2014, p. 10. “If you had only $2,222 to your name (adding together your bank deposits, financial investments and property holdings, and subtracting your debts) you might not think yourself terribly fortunate. But you would be wealthier than half the world’s population, according to this year’s Global Wealth Report by the Credit Suisse Research Institute. If you had $71,560 or more, you would be in the top tenth. If you were lucky enough to own over $744,400 you could count yourself a member of the global 1% that voters everywhere are rebelling against. “Unlike many studies of prosperity and inequality, this one counts household assets rather than income. The data are patchy, particularly at the bottom and the top of the scale. But with some assumptions, the institute calculates that the world’s households owned property and net financial assets worth almost $256 trillion in mid-2016. That is about 3.4 times the world’s annual GDP. If this wealth were divided equally it would come to $52,819 per adult. But in reality the top tenth own 89% of it. “That lucky tenth now includes over 44 million Chinese, about 4.4% of the country’s adult population. A far greater number (almost half of China’s adults) cluster in the next three deciles down. Closer to the bottom of the ladder, there is a similar bulge of Indians with wealth between $30 and $603. “Below them, the bottom tenth is a peculiar mix. It is populated by poor countries, where many people have nothing, and rich ones, where people can own very much less than that. It includes a surprising number of Americans (over 21 million), whose debts outweigh their assets. But most Americans are much better off. Over 40% belong to the top tenth of the global wealth distribution (and over 18 million belong to the global 1%). Some of those railing against the global elite probably do not even know they belong to it.” —“Global Wealth: The One per center next door”, The Economist, Nov. 26, 2016, p. 68. The correlation between an individual’s actual personal wealth, or more typically their perceived wealth, and their willingness to buy things and go further into debt. People in contemporary capitalist societies have been conditioned to borrow and spend more when they feel that their net wealth is increasing—even if they still have very large debts. During the U.S. housing bubble of the years 2003-2007, for example, the fact that the market value of homes was increasing rapidly for a few years led many people to take out a second mortgage, or refinance their existing mortgage with a cash-out option (i.e., to get an additional loan from the bank in return for signing over more of the value of their house to the bank). This seemed like a good idea to them at the time, because the capitalist media led them to believe that home prices would continue to rise indefinitely (and therefore that their net wealth would continue increasing indefinitely). Since the housing bubble popped, and the “Great Recession” hit, millions of these people have already lost their homes. As is nearly always the case in the end, the “wealth effect” turned out to be a dangerous illusion for the mass of working-class people. “Economists have only recently devoted serious study to how a decline in housing prices affects consumer spending, not least because this is the first decline in the average price of an American home since the Great Depression [of the 1930s]. A 2007 review of existing research by the Congressional Budget Office reported that people reduce spending by $20 to $70 a year for every $1,000 decline in the value of their homes. “This [negative] ‘wealth effect’ is significantly larger for changes in home equity than in the value of other investments, such as stocks, apparently because people regard changes in housing prices as more likely to endure.” —“Gloom Grips Consumers, and It May Be Home Prices”, New York Times, Oct. 18, 2011. “Weapons are an important factor in war, but not the decisive factor; it is people, not things, that are decisive.” —Mao, “On Protracted War”. A very small but notorious U.S. revolutionary organization of student orgins which existed from 1969 to 1977, with little in the way of developed revolutionary theory, no mass practice and no mass base. It is known mostly for its initial violent demonstration in Chicago in October 1969 against the U.S. imperialist war of aggression against Vietnam (the “Days of Rage”), and its sporadic and very counter-productive campaign of bombings of U.S. government buildings up through the mid-1970s. The WUO was originally a faction of the Students for a Democratic Society (SDS), the tiny faction in control of the SDS National Office in its last days. (Indeed, their antics were major factors in wrecking what remained of SDS and making those its last days.) Like most of SDS, the Weatherman faction was quite marked by its white, petty-bourgeois origin and makeup. While it did take a very strong stand against U.S. imperialism, and also strong stands in favor of Black liberation and women’s liberation, it had little or no connection with the working class, and seemed not even to want any such connection. It was more aligned with the youth counter-culture. Thus one of its characteristic capers was to aid a jailbreak and escape for Timothy Leary, the LSD drug guru! “We felt that doing nothing in a period of repressive violence is itself a form of violence. That’s really the part that I think is the hardest for people to understand. If you sit in your house, live your white life and go to your white job, and allow the country that you live in to murder people and to commit genocide, and you sit there and you don’t do anything about it, that’s violence.” —Naomi Jaffe, in the documentary The Weather Underground, produced by Carrie Lozano and directed by Bill Siegel and Sam Green, 2003. The terrible crimes of capitalist-imperialism do indeed demand a response! The trouble was that what the WUO decided to do was actually extremely counter-productive. The occasional bombings they engaged in did no serious harm at all to the U.S. government. And they had the effect of turning large numbers of ordinary American people, including students, more against the anti-war movement and any idea of revolution, than towards it. By thus finishing off SDS as a mass student organization they made it more difficult both to build the anti-war movement and to educate more young revolutionaries. In December 1969, the Chicago police and FBI raided the apartment of local Black Panter leader Fred Hampton, killing Hampton in his sleep (he had been drugged by a police agent) and Mark Clark, and wounding three other people. In early 1970, in response to this unprovoked murderous raid, the WUO issued a “Declaration of War” against the U.S. government, shifting to underground, covert activities only. This declaration was however mere posturing. It was more rage by helpless individuals cut off from any mass base actually capable of changing the situation. While always very small, by 1976 the FBI estimated that the WUO was down to less than 30 active members. They completely disbanded by the end of 1977, and many of them turned themselves in to the authorities. The original name of the Weather Underground anarchist-like revolutionary organization. German bourgeois sociologist, born in Erfurt and educated at universities in Heidelberg, Berlin and Göttingen. He began his professorial career by teaching law in Berlin in 1892, switched to teaching political economy at Freiburg in 1894, and then economics at Heidelberg in 1897. (All bourgeois economics, of course.) He did not actually consider himself to be a sociologist until near the end of his life. In 1897 he suffered a serious mental breakdown and did no significant work for about four years. Then, for a number of years he was mostly an unaffiliated private scholar, working on a wide variety of topics. In 1918 Weber accepted the chair of sociology at the University of Vienna, and finally in 1919 took over the chair of sociology at Munich. Max Weber (along with Émile Durkheim) is widely regarded as one of the principal founders of “modern sociology”, which from its beginning as an intellectual area of study at universities was created and developed in contrast and opposition to Marxism. The philosophical basis that Weber provided for this new subject of academic “sociology” was neo-Kantianism, of the school associated with Wilhelm Windelband and Heinrich Rickert in late 19th century Germany. This philosophy drew a total distinction between “phenomena”, or the external world we perceive, and “noumena”, or the perceiving mind or consciousness. Weber considered this distinction to be the difference between the basis for natural science and social science, and this confirms the fundamental philosophical idealism of Weberian sociology. For example, one of the conclusions Weber drew on this Kantian philosophical basis, was that sociology could not establish any scientific laws (as is done in physics, chemistry and biology), but rather only to try to give some plausible explanations for social developments in their particular historical contexts. Despite this denial of any true scientific laws in sociology, Weber did suppose that the “probabilities” of human action (such as that people are likely to act rationally much of the time) allow for some limited understanding of society. Similarly, Weber promoted the Kantian value/fact dichotomy which is still so widespread in bourgeois “social science”, and claimed for example that there is no rational basis for determining moral goals—though he did acknowledge that there are rational ways to proceed once one set of goals or another are adopted. Of course, for revolutionary Marxists the setting of moral (and political) goals is a simple and very rational matter: we say that those things which are in the real beneficial interests of the proletariat and masses are good and rational goals, including the central goal of making social revolution upon which so many other goals depend. [See: Class Interest Theory of Ethics] Like all Kantians, Weber was opposed to what they snidely call “instrumental rationality” in ethics. For them paying any attention to what benefits people, let alone classes of people, has no bearing at all on ethics! There are disputes within academic sociology as to exactly what Weber’s political views were. Weber’s criticisms of socialism always either entirely misunderstand what genuine socialism is, or else purposely distort what it is, as in his claim that socialism inevitably aggravates the problem of bureaucracy. Some argue that Weber was a proto-fascist; others that he was more of a liberal. The fact that his writings can be read to support either view already says something very negative indeed about him! One thing is very clear, however: he was a bourgeois ideologist to his very core. It is strange that even today, and even on the so-called “left”, there continues to be some interest in his reactionary views. “I am a member of the bourgeois class, feel myself to be such, and have been brought up on its opinions and ideals.” —Max Weber, 1895, quoted in Franco Moretti, The Bourgeois: Between History and Literature (2014). [Author Jan Myrdal describing his attempts to help a woman without housing to obtain permission to move into his vacated government-regulated apartment, and urging her to be much more assertive with the government bureaucrats in social-democratic Sweden during the post-World War II period.] “So I coaxed her. There is a welfare state around somewhere. They speak about it at election time. She had a full time job and paid her taxes. I told her she had the same rights as others. She had the right to get assistance. Every politician in the country was saying this. But she didn’t yet want to go to the authorities. “‘I haven’t done anything wrong’, she said. “But I spoke convincingly about the state and the society existing for the protection and care of the citizens and that the officials get paid by tax money in order to work and be helpful. (For myself I don’t believe this, but the argument can be used if you want something done. After all, it is what they all say. )” —Adapted from Jan Myrdal, Confessions of a Disloyal European (1968), p. 193. A petty-bourgeois distortion of Marxism which has developed at universities in capitalist countries in the “Western” part of the world. The revolutionary heart of Marxism is virtually entirely cut out in this milieu, and the major focus is the sphere of culture, which is discussed in pretentious academic and esoteric language. So-called “Western Marxism” reflects decadent bourgeois ideology far more than it does Marxism. My advice is that you don’t waste your time with this sort of garbage; it can only corrupt your brain. —S.H. “That realm [of the superstructure] was defined far more broadly than Marx ever imagined. It encompassed any and every sort of cultural commodity—a pair of winklepicker shoes, a newspaper photograph, a pop record and a packet of breakfast cereal were all ‘texts’ that could be ‘read’. The critique of mass culture from early theorists influenced by the Frankfurt school was gradually supplanted by a study of the different ways in which people receive and interpret these everyday texts. As cultural studies took a ‘linguistic turn’—evolving through structuralism, post-structuralism, deconstruction and then postmodernism—it often seemed a way of evading politics altogether, even though many of its practitioners continued to call themselves Marxists. The logic of their playful insistence that there were no certainties or realities led ultimately to a free-floating, value-free relativism which could celebrate both American pop cultural and medieval superstition without a qualm. Despite their scorn for grand historical narratives and general laws of nature, many seemed to accept the enduring success of capitalism as an immutable fact of life. Their subversive impulses sought refuge in marginal spaces where the victors’ dominance seemed less secure: hence their enthusiasm for the exotic and unincorporable, from UFO conspiracy theories to sado-masochistic fetishes. A fascination with the pleasures of consumption (TV soap operas, shopping malls, mass-market kitsch) displaced the traditional Marxist focus on the conditions of material production.... No systematic critique of monopoly capitalism could be achieved since capitalism was itself a fiction, like truth, justice, law and all other ‘linguistic constructs’.” —Francis Wheen, Marx’s Das Kapital (2006), pp. 105-7. A Wholly Foreign Owned Enterprise. This is an acronym common in the business press in contemporary global capitalist-imperialism to refer to a company which operates in one country (such as China or Thailand) but which is entirely owned (or at least entirely controlled) by capitalists located outside that country.